Stanwell Park Overbridge is where the old Coast (Illawarra) Road crossed over the original single line railway in Stanwell Park. Prior to 1925, the overbridge formed part of the main roadway through Stanwell Park, and the history of the road stretches back to the 19th century. People would travel this road by horse & cart, foot, and later on; motor cars. 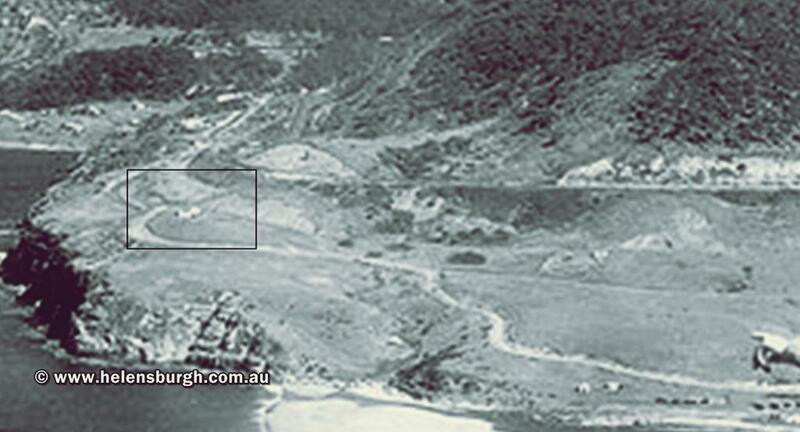 Lawrence Hargrave Drive as we know it today, used to be the main railway line (from Sydney) through Stanwell Park. Evidence of this is still present today in and around Stanwell Park. The main thoroughfare through Stanwell Park where Chellow Dene Avenue meets Lawrence Hargrave Drive, and nearly all the way to Coalcliff; was the original railway line from October 1888 until 1920. In fact, Chellow Dene Avenue is also the original railway line as it follows back to the southern portal of the Otford Tunnel. In the Bing Map below, you can see where Lawrence Hargrave Drive meets Chellow Dene Avenue, and the 2nd image plots the original road and railway. If today’s road was the original railway line; where did the horses & carts / cars go? Answer. Down Bald Hill, and at the hairpin, the road went through and joined today’s Old Coast Road. It then travelled via a level crossing, over the railway line (petrol station intersection), and continued down the Lower Coast Road, and across the Stanwell Creek causeway. It then gently meanders up the Lower Coast Road, where it would eventually cross the overbridge. [See the image below] After crossing the bridge, the road would run parallel with the railway line (current road) up until the road crossed back to the east side of the railway via a level crossing near Coalcliff. 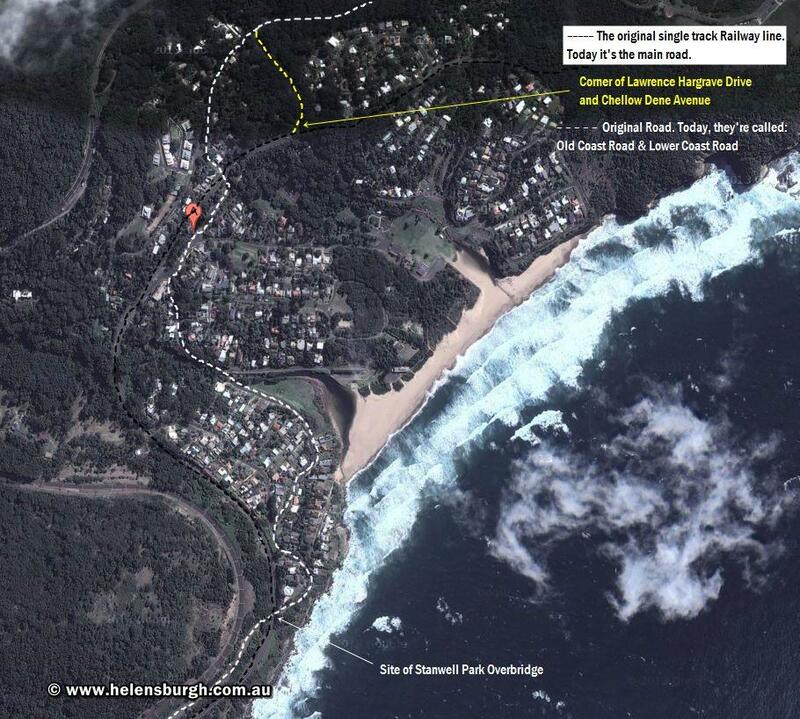 Stanwell Park’s First Railway Station was located on the corner of Lawrence Hargrave Drive and Old Coast Road, approximately near the old Petrol Station today. Station Street in Stanwell Park got its name for a very good reason as it begins (or ends) at the original railway station. If you look in the background of the image below, you can just make out the footbridge that was constructed in 1911 when the second (down) platform was made. Two large brick culverts were constructed to take the rail line over Hargrave Creek and Stanwell Creek. The culvert on Stanwell Creek is commonly referred to as the “Blue Hole” because of the deep hole that contains the water on the east side of the culvert. It’s a favourite swimming spot during summer and I swam there several times when I was young, and even walked through the culvert. 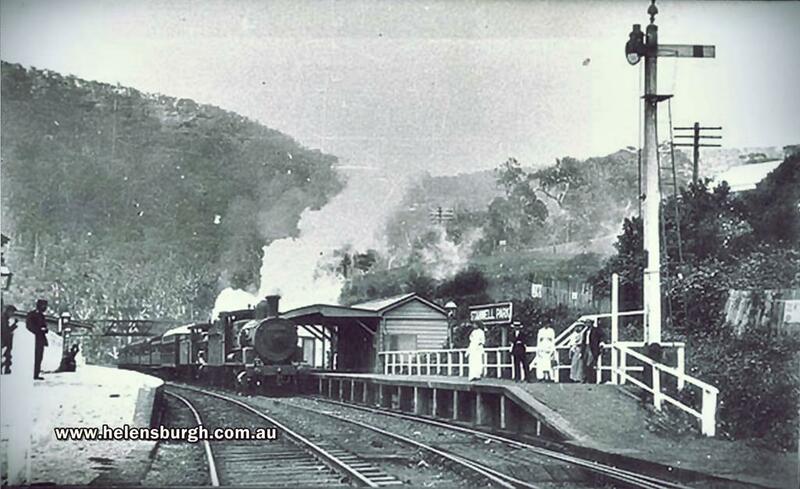 The overbridge would continue to take road traffic over the railway line until the Railway Deviation (duplication) was completed in Stanwell Park in 1920. (The deviation works were completed nearly 5½ years after Helensburgh to Waterfall, due partly to the 1914-1918 World War). 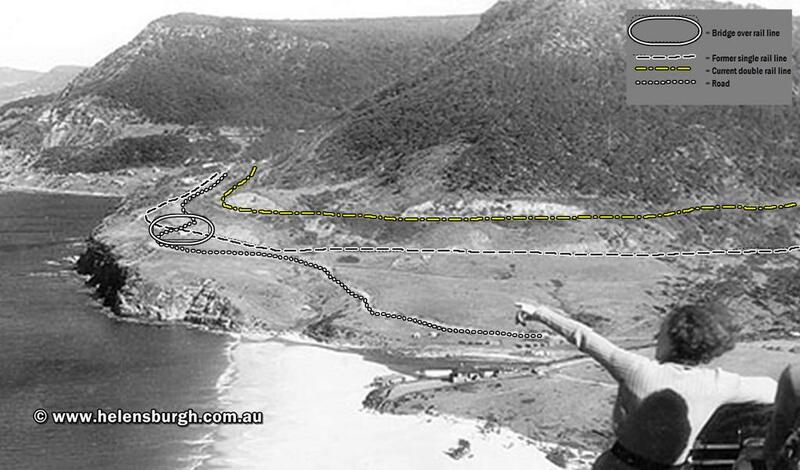 For five years, (1920-1925) after the the new double railway line opened around the Stanwell Park amphitheatre, the old single track railway line lay dormant. It wasn’t until 1925 that the Main Roads Board (RTA), would take advantage of the former railway line and transform it into Lawrence Hargrave Drive as we know and use today. Below is the location of the overbridge; where today’s Lower Coast Road ends and meets with Lawrence Hargrave Drive. Click images for larger view. Where the overbridge was located. It is unknown to me when the overbridge was built, let alone removed; but all that remains today are some brick mounting foundations, rusty bolts and aging railway sleepers in the cutting. Hidden above the foundations in the undergrowth, are some more brickwork where the bridge met the land. It safe to approximate that the remains are at least 100 years old.